Like its painted desert landscapes, New Mexico is always different, always mysterious. 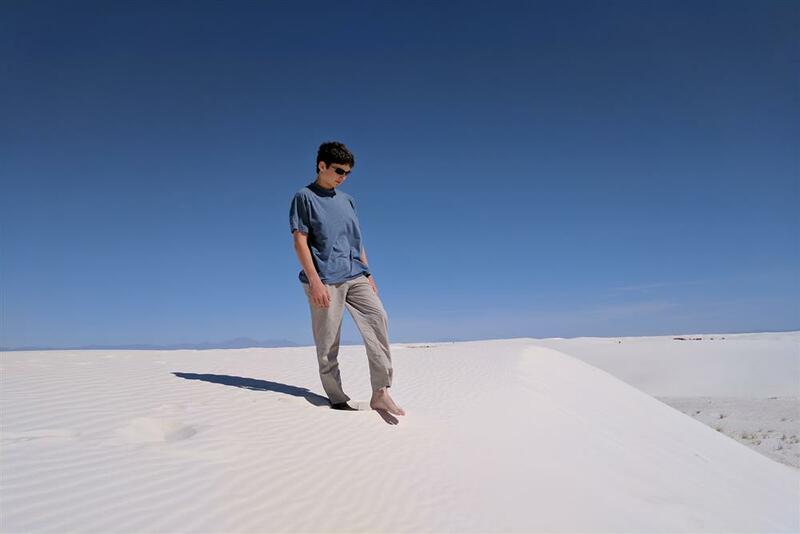 And just when you think you’ve figured it out, it shifts suddenly like powdery silicate in a wind gust at White Sands National Monument, or the enigmatic native American art in the light of a setting sun, or the red-and-green chile sauce on your plate that’s called Christmas but burns like summer. Framed by the jagged Organ Mountains, this quiet town is a fitting preview for what lies beyond it: White Sands National Monument, a bizarre but beautiful landlocked beach. Enormous blinding-white sand dunes await visitors around every bend. Rent a sled and slide down one of these sand hills or build a giant castle. The photos I took of White Sands were priceless. My middle son, Iden, at first wanted nothing to do with this place. What could you possibly do with all that sand? And there’s no ocean. By the time he’d taken a few runs on an innertube, he didn’t want to leave. Ah, 12-year-olds! We couldn’t help texting our friend Larry, who produces documentaries about alien encounters. We were so close to Roswell, with its famous UFO Museum, how could we not? But instead of driving all the way to the site of the alleged 1947 UFO crash, we headed over to the New Mexico Space Museum, which celebrates space exploration by humans. The museum has an impressive rocket garden that features a variety of military and civilian rockets, including a rocket sled that reached a velocity of 632 mph. Inside, there are tributes to the most accomplished human space explorers and a fun Star Trek exhibit. 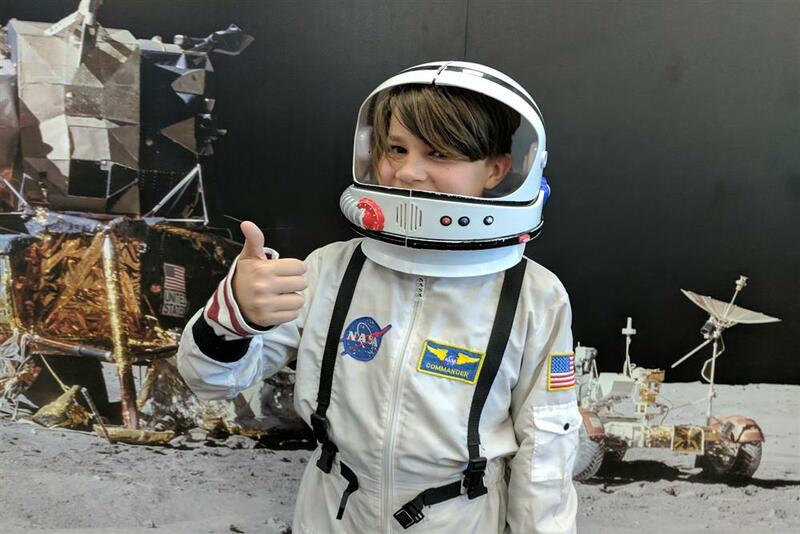 For the kids, there’s a play area where they can “dress up” as an astronaut and take a picture against a lunar backdrop. Albuquerque awaited, which for us was equally mysterious. We checked into a new property, the Hotel Chaco, inspired by Chaco Canyon, a UNESCO World Heritage site in the northwestern part of New Mexico. 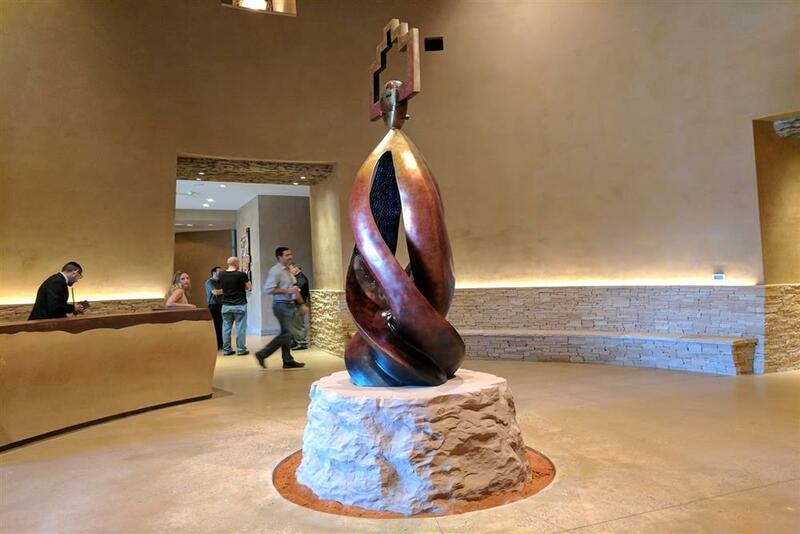 For us, this was more of a museum than a hotel, with original native American art on the walls and serene indigenous music wafting through its cavernous check-in area. And that’s a good thing when you’re traveling with children ages 10, 12 and 14. You want them to respect the hotel. No horsin’ around, kids! They saved it for the pool, which had just opened after a sudden late spring snowstorm. The locals only roll their eyes when you mention the snow: “That’s Albuquerque weather,” they say. It’s mysterious — and unpredictable. Speaking of museums, Albuquerque has several you shouldn’t miss. One of the newest is the Anderson-Abruzzo Albuquerque International Balloon Museum, quite possibly the most compelling specialty aviation museum we’ve ever visited. It explains how balloon flight evolved from its beginnings in 1783 to the present day. There are fascinating exhibits on the physics of flight and actual balloons used to cross the Atlantic and Pacific. Of course, you have to actually ride one of these balloons to understand what makes it so special. On this trip we didn’t have that opportunity, but on two previous occasions, we woke up bright and early and drove over to Rainbow Ryders for a balloon excursion over the city. Pro tip: Bring a warm jacket and your camera. Another must-see museum: the Albuquerque Museum of Art and History. If you want to try to understand this place, you really have to start here. 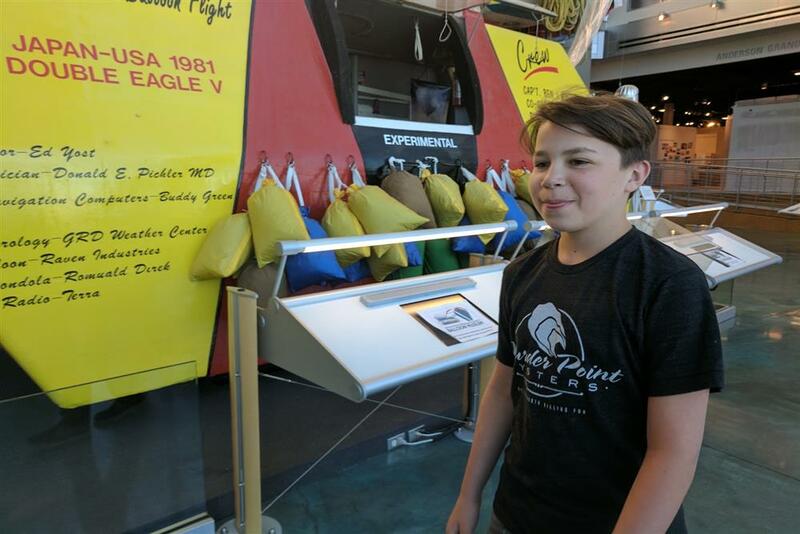 The kids were drawn to an exhibit called Chasing the Cure to Albuquerque, about the city’s history of treating and rehabilitating tuberculosis patients. People suffering from TB were drawn to the area because of its climate. I had no idea that, without TB, the city probably would not exist as we know it. There are permanent exhibits of note, too, that offer a comprehensive history of Albuquerque, all well worth a visit. But perhaps the biggest New Mexico imponderable is the food. Whether it’s the nuclear-hot chile sauce served at the famous El Pinto restaurant or the exotic sherbet desserts dished out at the Chaco, the New Mexican food caught our attention and held it for the duration of our journey. Burning and ice. High and low. Old and new. It’s a travel story cliché, to find the contrasts. But that’s how Land of Enchantment got its name — it’s filled with mysterious energy, constantly evolving and enigmatic. It’s what makes New Mexico what it is, and while we’ll keep coming back again and again to try to figure it out. For easy access to Old Town, try Hotel Chaco or the nearby Hotel Albuquerque. The Chaco is more of a boutique hotel, and rooms have lots of great amenities (try the chocolate-covered granola bars at turndown), while the Albuquerque is Old Town’s convention hotel. In Las Cruces, the Holiday Inn Express & Suites Las Cruces North is close to the city’s attractions and restaurants, and offers easy highway access. The Museum of Natural History picks up where the nearby history museum leaves off, exploring New Mexico’s prehistory. One riddle solved: How those white sand beaches came to be. Turns out much of the state used to be under water. Also worth checking out: the National Museum of Nuclear Science & History. If your kids are a little older and can sit through a live performance, check out Tablao Flamenco for dinner and an evening of Flamenco dancing.